Hand crocheted with acrylic baby yarn, this petite turtle’s shell is striped in shades of blue, mint green, and yellow. His body is a solid baby blue. His features are hand embroidered, so there are no small parts that can pulled off. He is stuffed with polyester fiberfill, making him easy to wash and dry. I haven’t named this turtle as I usually do because he is just a baby, and I think his new owner should name him. He is just perfect for a baby gift, a shower gift or a collectable for young or old. 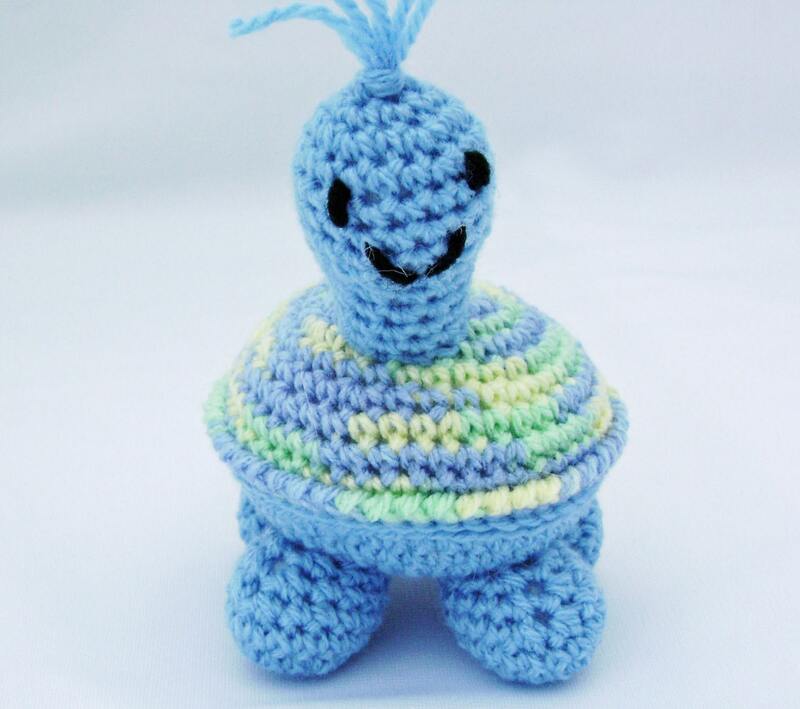 This little guy is made exactly like my standard turtles, but with dk weight yarn and a smaller crochet hook. The turtle is approximately 3 inches (7 ½ cm) wide and 4 inches (10 cm) tall, not counting his topknot.